Bowammunition:TM -----I will be applying for a provisional patent. Bowammunition:TM is a new invented ammunition [projectile] to be used with a compound bow that has a medium to large window incorporated into the bow. Bowammunition:TM, when used with a compound bow; transforms the compound bow into a hand held catapult or in North America it is called a slingshot, but the apparatus retains the power [kinetic energy] of the compound bow. To use this ammunition with a compound bow, the "Arrow Rest" on the bow must be removed and a bow [archery] release mechanism has to be used in conjunction with the "Bow and Bowammunition:TM". Description of Bowammunition:TM and this trademark design. Bowammunition:TM is manufactured from 10 or 12 gauge high tensile strength steel wire. The wire starts out straight and is about 3.5 inches long or 9 cm long, one end has a "U" shaped bend and the inside diameter of the bend is about .5 inch diameter. The other end of the wire has a "U" shaped bend, in exactly the opposite direction of the first end, and the bend is about .5 inches in diameter. The straight wire between the two bent ends is about 2 inches. 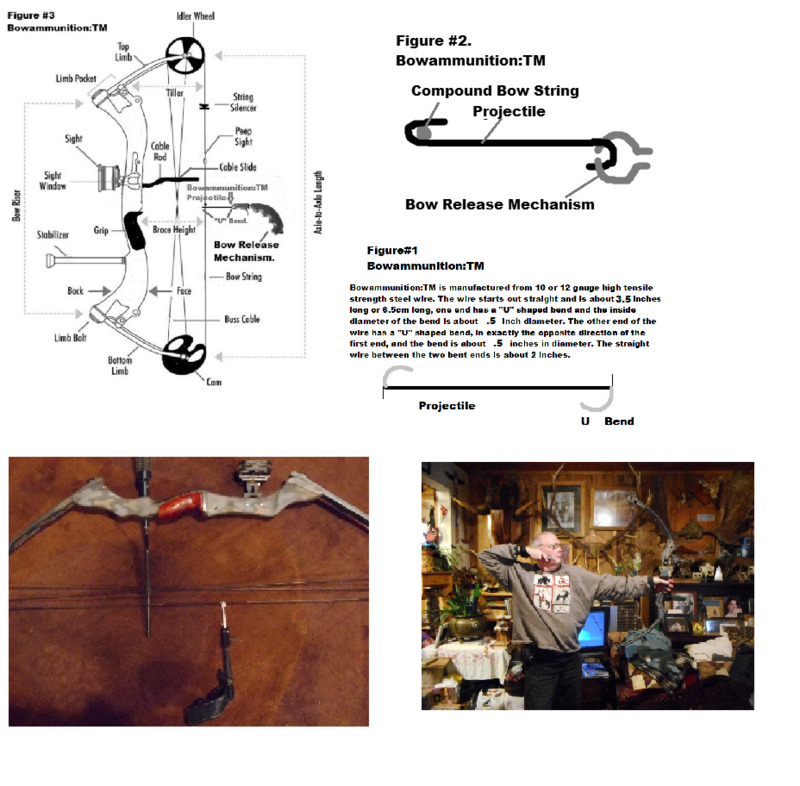 Figure #1 shows the straight wire and Figure #2 shows the wire with the ends bent and in the shape of [ Bowammunition:TM ] Figure #3 shows Bowammunition:TM in use with a compound bow. Once the bows arrow rest is removed from the compound bow, the bow is ready to use Bowammunition:TM. Take a Bowammunition:TM projectile and hook one end on the bow string, where an arrow is nocked. Fasten the other end of the Bowammunition:TM projectile to the hook of the bow release mechanism. An archer then draws, aims and releases the projectile the same way as an arrow. With a conventional compound "bow and arrow"; the arrow is nocked on the string and then the string is pulled back with the release mechanism. The archer aims and pulls the trigger of the release mechanism and then the string pushes the arrow into flight, from the back of the arrow. 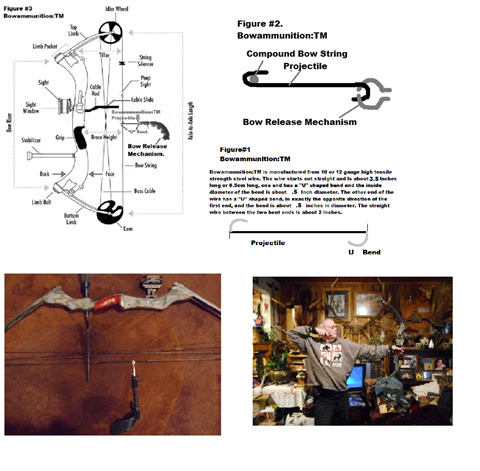 With "Bowammunition:TM" , the projectile hooks on to the compound bow string at the nocking point and then the release mechanism is attached to the other end of the Bowammunition:TM projectile. The projectile is then pulled or drawn back and this in turn draws back the bow string. The archer aims and pulls the trigger of the release mechanism and then the projectile is pulled, from the front of the projectile, in to flight. very inexpensive to manufacture and will be sold in packages of 100 or 500 units, at a price that is less than one arrow. in order that the detailed description here in may be better understood, and in order that the present contribution to the art may be better appreciated. There are, of course, additional features of Bowammunition:TM that will be described hereinafter and which will form the subject matter of the claims . Those skilled in the art will appreciate that the conception, upon which this disclosure is based, may readily be utilized as a basis for the designing of other structures, methods and systems for carrying out the several purposes of the present trade mark design. It is important, therefore, that the claims be regarded as including such equivalent constructions insofar as they do not depart from the spirit and scope of the present trade mark design, titled “Bowammunition:TM” . The purpose of the foregoing, is to enable the public, and practitioners in the art who are not familiar with new trade mark designs, to determine quickly from a cursory inspection the nature and essence of the technical disclosure of the application. The foregoing is intended to define the trade mark design of the ammunition apparatus, which is measured by the claims, it is not intended to be limiting as to the scope of the trade mark design in any way. These together with the various features of novelty which characterize the trade mark design, are pointed out in claims. For a better understanding of the trade mark design, reference should be made to the accompanying drawings and descriptive matter in which there is illustrated preferred embodiments of the design. As to the manner of usage and operation of the trade mark design, the same should be apparent from the above disclosure and accordingly no further discussion relative to the manner of usage and operation of Bowammunition:TM shall be provided. With respect to the above description then, it is to be realized that the optimum dimensional relationships for the parts of the trade mark design , to include variations in size, materials, shape, form, function and manner of operation, assembly and use, are deemed readily apparent and obvious to one skilled in the art, and all equivalent relationships to those illustrated in the drawings and described in the document are intended to be encompassed by the present trade mark design. The foregoing is considered as illustrative only of the principles of Bowammunition:TM. Since numerous modifications and changes will readily occur to those skilled in the art, it is not desired to limit the trade mark design to the exact construction and operation shown and described, and accordingly, all suitable modifications and equivalents may be resorted to, falling within the scope of the trade mark design. This document to be used for patent and trademark claims. Bowammunition:TM-- Copyright;November 19, 2018: by Emmor Ray Sperry. The distinctive design of " Bowammunition:TM ", the word " Bowammunition:TM " are trademarks of Emmor Ray Sperry. The distinctive usage of the design, is part of the trade mark design of Bowammunition:TM. An exclusive copyright is claimed on the entire text, all drawings and sketches of “Bowammunition:TM” that exist. Any infringement on this copyright or this trade mark, in whole or in part, without permission in wrighting from Emmor Ray Sperry, is strictly prohibited. A United States registered copyright has been applied for. American, Canadian and foreign patents are under consideration. U.S. Copyright #TXu002124858 . Your Application and payment for the work Bowammunition:TM were received by the U.S.Copyright Office on Date/Time :11/19/2018 12:15:39 PM. Copyright Case #17150960531.